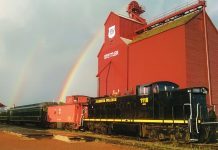 Diesel power at an affordable price! For serious RV enthusiasts, nothing beats the comfort and longterm durability of a rear diesel pusher. We visited The Hitch House in Barrie, Ontario to test drive the 2014 Thor Motor Coach Palazzo – an affordable diesel motorhome that incorporates some of the latest advances in RV technology in an impressive package that will turn heads wherever you travel. This class A diesel pusher is a serious motorhome, built on the Freightliner XC straight rail chassis and powered by a 300-hp Cummins ISB engine that delivers 660 foot-pounds of torque. With a very smooth Allison MH-2500 6-speed automatic transmission, there is plenty of power for modern highway driving. The chassis is a pleasure to manoeuvre in campground situations, with a tight turning radius thanks to the I-Beam front axle and 55° wheel cut. On the country roads the Air-Ride suspension and Sachs® shock absorbers deliver a smooth and stable ride. 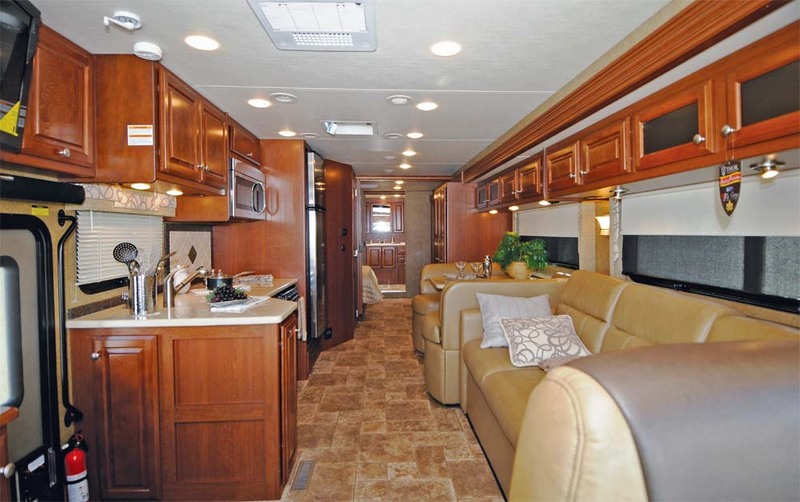 The massive slide on the driver’s side provides exceptional interior space in this 37’6″ motorhome. 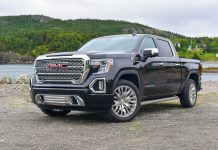 It only takes a few minutes to become accustomed to driving a vehicle this size, thanks in large part to the standard rear vision camera system. The power steering, automatic transmission and large heated remote control side mirrors with integrated side view camera system take the effort out of the driving experience. Comfort is the key for an enjoyable RV touring experience, and the leatherette six-way power adjustable driver’s seat is excellent. Your co-pilot will enjoy similar comfort, and the flip-up PC workstation integrated into the dashboard is a real bonus. With cruise control, tilt and telescopic steering column, and a power front roller shade to block the sun, you are the master of your driving environment. 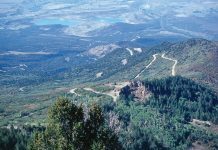 Please note that you will require air brake endorsement to drive the Palazzo, but this is not a difficult skill to master – see the last paragraph of this test on licensing requirements for motorhomes above 22,000 pounds GVWR. We found the full front and rear anti-lock drum brakes to be very well suited for a vehicle of this size, and the exhaust brake is very helpful on long descents. If you pull a car or a trailer behind your motorhome, the Palazzo has a 10,000 lb trailer hitch and 7-pin wiring harness as standard equipment. 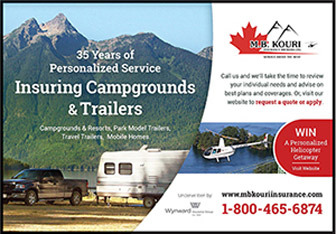 There are many features of this motorhome that make it a pleasure to operate. For example, Thor Motor Coach provides dual fuel fill locations – ideal for the times when you have limited access to the diesel pump at the gas station or when you just can’t remember whether the fill port is on the right or left side – in the Palazzo it really doesn’t matter – you have both! The RV component of the Palazzo is state-of-the-art, with a fully welded tubular steel floor system and a fully welded tubular aluminum roof and sidewall cage structure. The roof, walls, and floor are Vacu-Bond™ laminated construction with high density foam block insulation. The front and rear caps are one-piece molded fiberglass units. 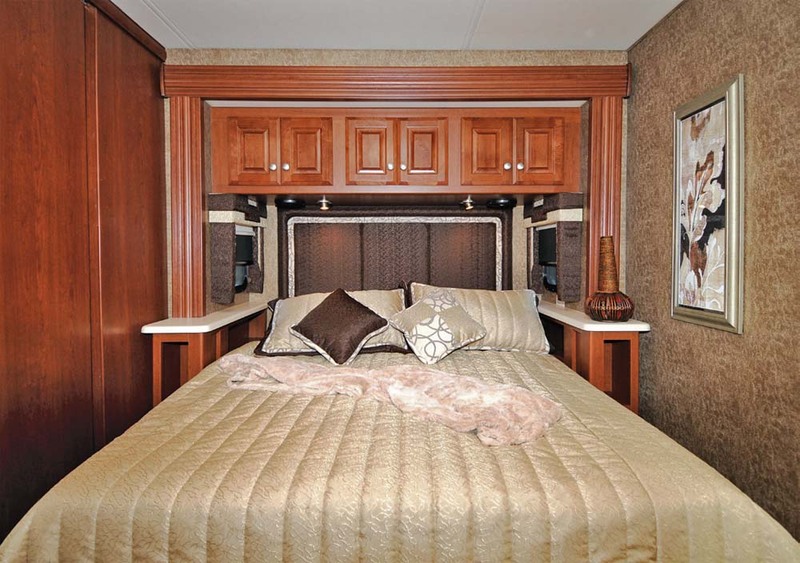 This motorhome features a driver’s side slide-out that is approximately 24’ long, and a passenger side bedroom slide-out that holds the headboard for the queen size bed. When retracted for travelling, the slides allow easy access from front to rear in the vehicle – when extended, the interior space is substantially enhanced. The Schwintek mechanisms are lighter, faster, and quieter than earlier systems – a definite plus in every respect. Automatic topper awnings help keep leaves, debris, and water from collecting above the slide-outs. 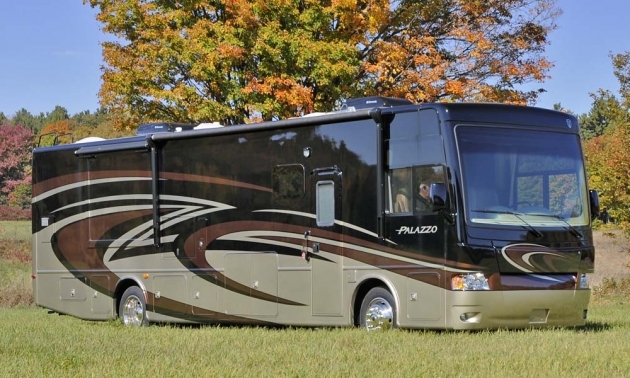 The Palazzo is built to last, with a domed TPO roof for durability and sidehinged flush mount radius corner compartment doors providing easy access to fiberglass lined luggage and storage bays. 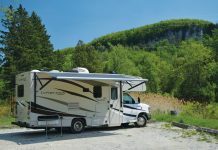 There is 170 cubic feet of basement storage, including a “mega storage” passthrough compartment that is tall enough to accommodate gear that probably would not fit into the average motorhome, and a low-profile slide tray to save your back. 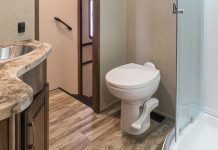 Thor Motor Coach has also created a “mud room” compartment by providing a sliding access door between the entry stairwell and the storage compartment… a great idea that obviously came from an experienced RV traveller. A full dresser and closet wall with 29” LED TV is at the foot of the bed. 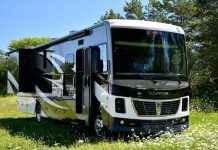 This motorhome has many features and components that we would expect to see only on vehicles at a significantly higher price point. The full-body paint with gel-coat walls is very well executed, and we really liked the one-piece windshield and black “frameless” dual pane windows. Our test vehicle came with the optional “invisible bra shield” – something we would encourage you to order for your motorhome – it really helps protect the finish from stone chips and road wear. With 255/70R 22.5 radial tires and stainless steel wheel liners, the vehicle is dressed to thrill from the roof to the road. From the automatic electric entry step with rubber treads and the acrylic exterior grab handle to the lighted storage compartments, all of the safety and convenience items are standard equipment, including carbon monoxide, LP and smoke detectors. 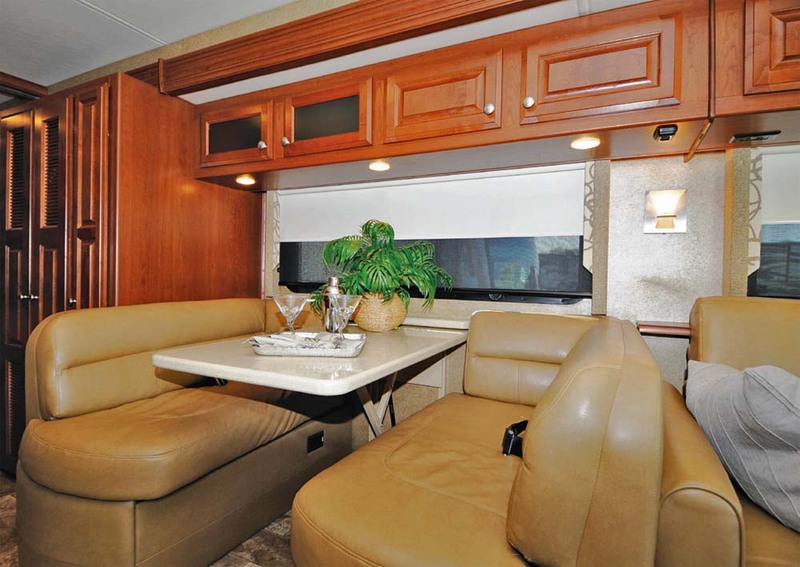 The driver’s slide-out is massive – it holds the dinette and front sofa. 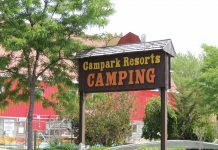 The Palazzo is a dream to set up in the campground. 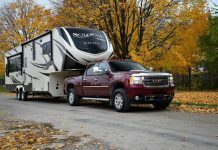 Glide into a pull-through site or use the rear vision camera with audio to help you back in, and you can begin the arrival procedure… set the parking brake, and use the touch pad to activate the automatic leveling jacks, and you are almost ready to enjoy camping. 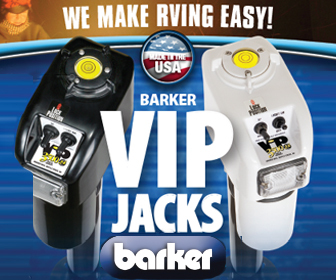 At this point, we generally turn off the engine and connect the motorhome’s 50-amp power cord to the campsite electrical hookup. 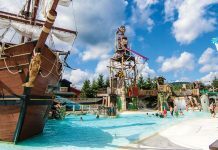 In a matter of seconds, you will be ready to extend the slide-outs, and then you can open the centralized utility station compartment to access your water, sewer, and cable TV hookups. Touch one button to extend your awning, and you are ready to enjoy your Palazzo. Touch a button and the Hide-AWayTM bunk bed lowers into place. With the bunk raised you barely notice this outstanding option! 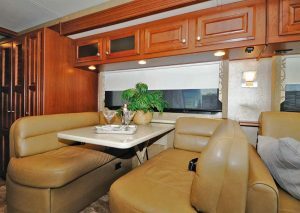 Frankly, we were amazed at how much luxury Thor Motor Coach has provided in this moderately priced motorhome. The furnishings are plush, the cabinetry is upscale, and the accoutrements are elegant. We really like the optional power Hide-A-Way™ bunk bed above the cockpit – this concept has been refined by the use of an inflatable mattress to save space compared to earlier designs. The Palazzo is available in a selection of interior colour schemes, with raised hardwood cabinet doors and large windows dressed with solar and privacy roller shades. The soft-touch vinyl ceiling is accented with halogen lighting, creating a very warm and elegant mood throughout the coach. 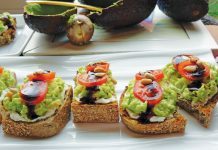 You can enjoy a full range of entertainment when you travel in a Palazzo. 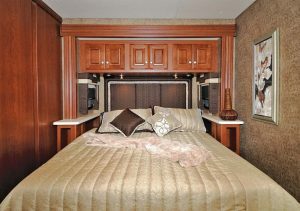 The motorhome is equipped with a 32” LED TV in the livingroom, and a 29” LED TV in the bedroom. You can go for an optional 32” LED TV that fits into an exterior compartment. 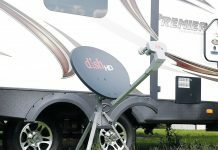 There is a DVD player with sound bar that can feed the various TVs, and the vehicle is prewired so you can easily hook up to your HD/DSS satellite system. The interior is very spacious – your dinette, sofa and closet are in the full wall slide! The Palazzo galley is very nicely planned, with solid surface countertop, three-burner gas cooktop, and a large double bowl sink with single lever faucet. 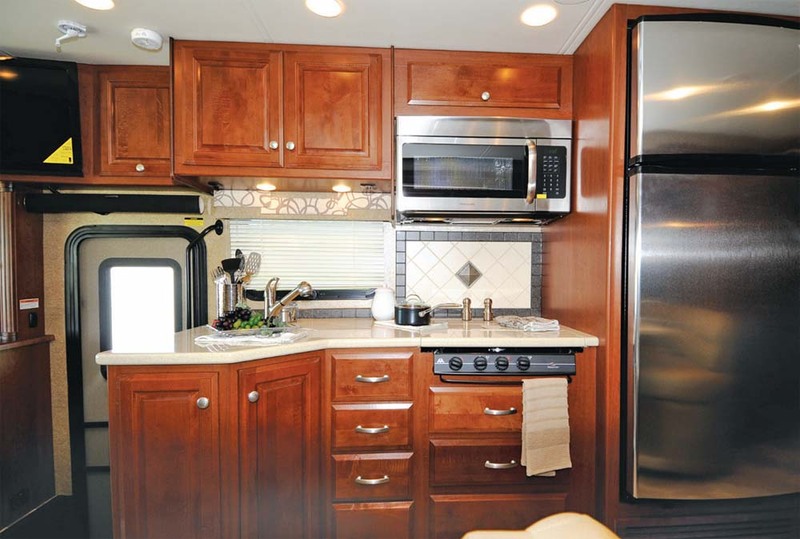 Our test unit was very well-equipped with a stainless steel Whirlpool 18-cubic foot residential refrigerator and a matching 30” Whirlpool over the range microwave oven. 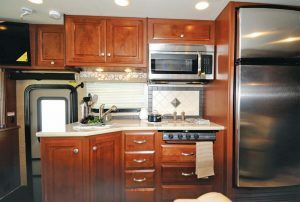 This is a departure from the usual roster of RV appliances, and some readers may wonder how Thor Motor Coach engineers approached the use of residential components in an RV galley. 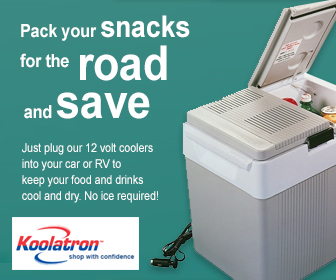 It is all a matter of properly equipping a motorhome – four auxiliary house batteries and a 2000-watt inverter power these appliances while you are on the road. When you are dry camping, there is an Onan RV QD 6000 diesel generator to supply your electrical requirements. We really like the large pull-out pantry, the Fantastic™ power vent, and the Beauflor™ residential linoleum – like everything else in this vehicle, these components are ideally suited for a vehicle of this type. The galley is compact but very well equipped with top quality components. For entertaining, the dinette and hidea- bed sofa provide comfortable accommodations for seven adults. Spin the captain’s and navigator’s chairs around and nine can dine in supreme comfort. 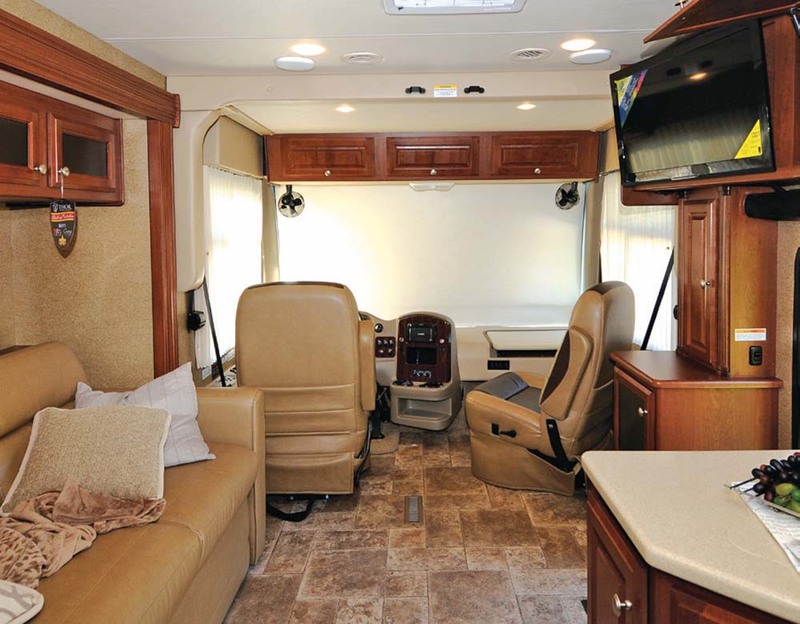 Without a doubt, this motorhome will be a comfortable home on wheels throughout the year. Dual low profile 13,500 BTU ducted roof air conditioners will keep you cool in the summer, and a 35,000 BTU ducted furnace with electronic ignition will keep you warm in the winter. With a 10-gallon gas/electric hot water heater there should be plenty of shower capacity. For cold weather storage, a water heater bypass system is accessible in the service compartment. 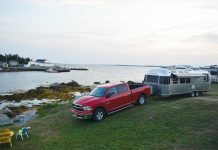 The Cummins engine comes with a 750- Watt in-block engine heater, and there is a coach battery disconnect to prevent your RV systems from draining the chassis battery. The diesel generator has automatic start, and you can monitor all of your RV systems at the touch of a button. 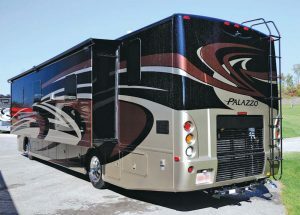 The Palazzo 36.1 can accommodate up to eight adults – the touring comfort is excellent, with an 84” hide-a-bed sofa and a 72” x 45” “Dream Dinette©” with one-touch sleeper, both are equipped with seat belts and easily convert to very comfortable beds. The master bedroom features a 60” x 75” queen-size bed with Premium Denver™ Mattress™, décor coordinated bedspread, and pillow shams. The headboard and sconce wall lighting complete the residential style bedroom. There is enough space to make the bed when one or both slides are extended. Extend the slide to enjoy a luxurious bedroom. The dresser and closets at the foot of the bed provide ample storage space, and there is a large closet just forward of the bedroom that can accommodate an optional stackable washer/dryer. Our test vehicle was equipped with the optional Splendide Ariston appliances – these have been very highly rated by our readers. 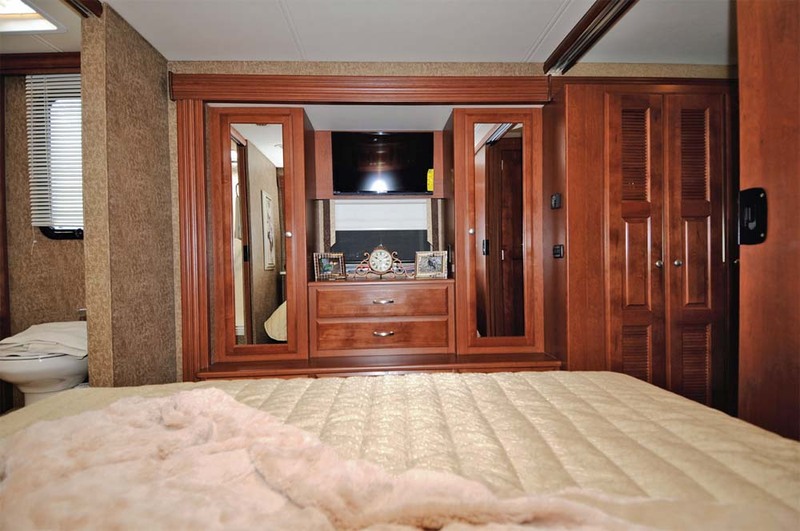 The Palazzo features a large rear bathroom and a half bath amidships. The rear bathroom is very well appointed with a large countertop and vanity, two spacious linen closets, a toilet and a large shower with glass door. The powder room has a toilet and a vanity sink. To drive a vehicle with air brakes, you will require an “air brake endorsement”, and for any vehicle above 22,000 lbs GVWR you will have to upgrade your driver’s license. Please consult the Ministry of Transport in your home province for specific requirements.